The Linyanti region used to be a hunting concession and for a while the animals were shy of the vehicles, but in the last decade the area has focused on photographic safaris. 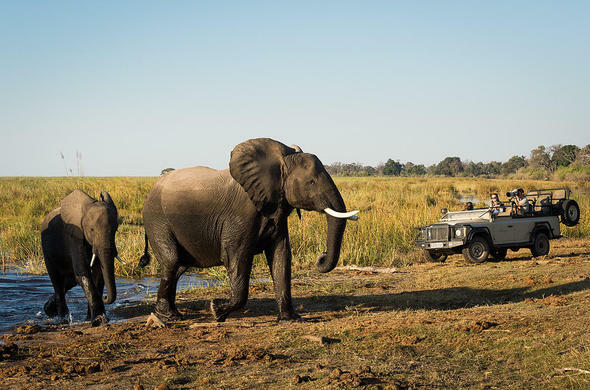 The Linyanti area has become one of the greatest wildlife destinations in Botswana. The Linyanti River, and when it is flowing, the Savute Channel, are the only sources of permanent water in the area. The area is known for the large herds of Elephants that pass through in the dry winter months. This population of Elephants reaches the highest density in the world during this period. The Savuti region of Linyanti was made famous through several documentaries shot by Dereck and Beverly Joubert - one of the most famous of which was "Eternal Enemies" about a war between lions and hyena. When the Savute Channel started flowing again, the pride of lions broke up and this seems to have stopped. As a result of the many Elephants in the region, some of the Mopane forest has been turned into scrubland due to the pressure of the Elephants feeding on them. Other species that migrate into the area over this period are Zebra, Buffalo and Tsessebe. 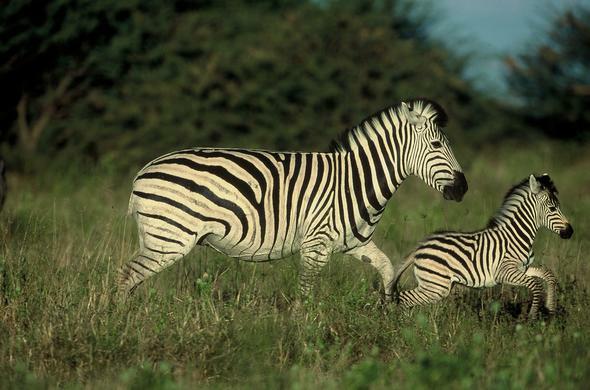 The Zebra migrate between the areas of good grazing and permanent water. They spend the winter months grazing along the Linyanti River, which is usually one of the only areas of permanent water in the south western area of the park. In the summer they move down to the Savuti Marsh where there is an abundance of nutrient rich grass which is fed by the local rainfall. Buffalo are generally found on the flood plains around the Linyanti Marsh and the Savuti Marsh. They like to congregate to feed on the lush flood plains of the marshes. They are never very far from a permanent water source. They are one of Africa's Big Five, as they are very dangerous when startled and wounded. 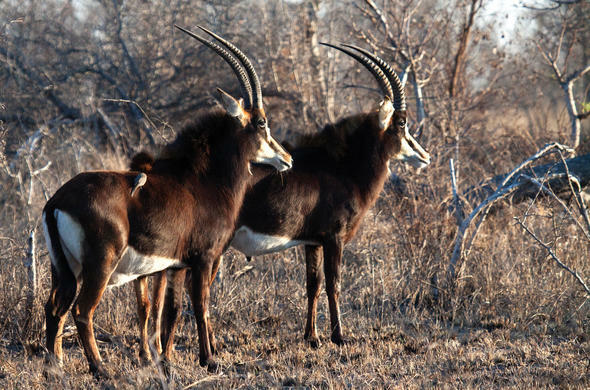 This region is also a good place to try and spot the rare Sable Antelope with their majestic curved horns. These large antelope are mostly black and have white down the sides of their face. These antelope are quite rare and it is always a thrill to catch sight of one. Due to the many acacia species in this concession, it is the perfect habitat for Giraffe. You are sure to catch sight of these tall reticulated antelope in the acacia thickets. You'll see many antelope that are common in the Chobe Reserve such as Wildebeest, Impala and Kudu. On the flood plains and along the floodplains you will see several Reedbucks and Red Lechwe. In the deep reed banks in areas of permanent water you may even catch a glimpse of the elusive Sitatunga. 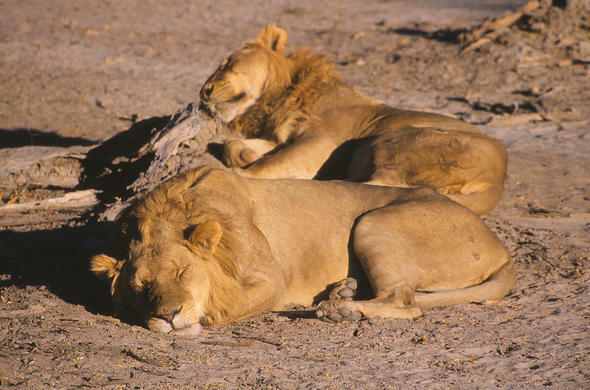 The area is famous for its many predators especially its many prides of Lions. Spotted Hyenas are also common in the area and Leopard can be seen in and around the riparian forests along the river fronts. In the drier, more open areas of the concession you may see the world's speediest cat -Cheetahs. Beautiful African Painted Hunting Dogs, which are also called Wild Dogs have a very wide home range and they often can be seen passing through the concession.